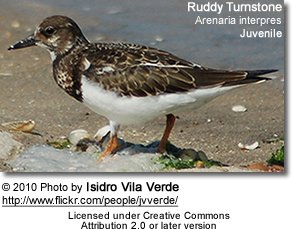 The Ruddy Turnstones (Arenaria interpres) are small, brightly patterned wading birds that occur naturally along the coastlines of all continents except Antarctica. 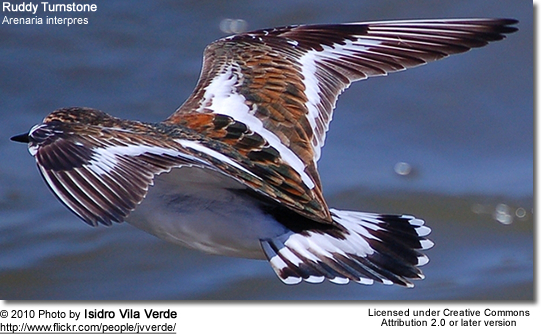 They breed in the northern parts of their range and fly south to winter on coastlines almost worldwide. Some of these birds have successfully undertaken impressive non-stop flights of about 4,720 miles (7,600 kilometers) from Australia to Taiwan in just 6 days. One individual even completed a return trip to Australia via the Central Pacific - a total round-trip of about 16,780 miles (27,000 kilometers). 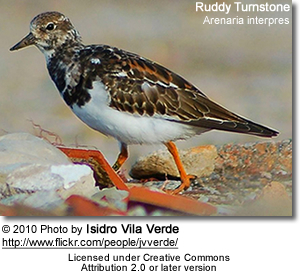 They are also known as Eastern Turnstones, Sea-Dotterel, Beachbirds, Calico-birds or simply Turnstones in areas where they are the only species of turnstone (which is the case over much of their range). 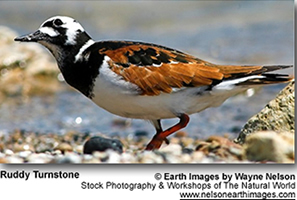 Turnstones get their name from their habit of turning over stones, shells, pieces of wood and other objects found on the beach when searching for food. Several of them may work together to overturn heavier items. Some refer to them as "seaweed birds" - as they often feed amongst the kelp at low tide. They are a common sight on rocky shores as they wander about, pecking, probing or flipping over stones; or they spend hours bathing or preening. They are also excellent swimmers. 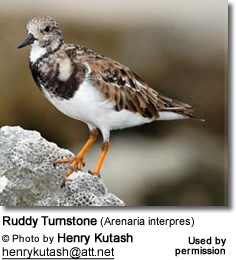 Ruddy Turnstones have a low annual mortality rate and live, on average, 9 years. The longest recorded individual lived 19 years and 2 months. They reach reproductive age when they are about 2 years old. 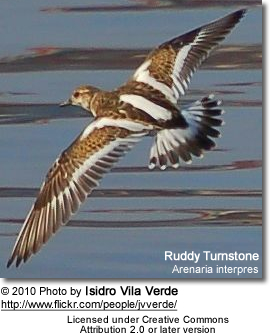 The Ruddy Turnstones are highly migratory birds that breed in the high Arctic Tundra along the coastline from western Alaska east to Greenland, and the arctic regions of Europe and Asia. In the Americas, they winter along the coasts of Washington and Massachusetts southwards to the southern tip of South America, as well as along the Gulf Coast. One unconfirmed vagrant was reported in the Falkland Islands. They rarely occur inland except during the migration when flocks of them occur around the Great Lakes. In Europe, they winter in the western regions from Iceland, Norway and Denmark southwards. Small numbers are found on Mediterranean coasts. In Africa, they occur all the way down to South Africa and on many offshore islands. In Asia, they winter as far north as southern China and Japan (mainly on the Ryukyu Islands). They are also quite common in Tasmania and New Zealand; as well as on numerous Pacific islands. Non-breeding birds may remain in their wintering range year-round, and some individuals still take on breeding plumages in the spring and winter. Migrating birds are usually loyal to particular sites and return to them year after year. Females usually leave the breeding grounds first, followed by the males and then their offspring. Migrating Birds may also be found in inland wetlands and around large lakes. Range: Breed in northwestern Alaska, on Axel Heiberg Island (one of Canada's most northern islands) and Ellesmere Island (most northerly point of land in Canada), Greenland (located between the Arctic and the North Atlantic Ocean) and Norway, Denmark, Sweden, Finland, Estonia and northern Russia. They formerly bred on the Baltic coast of Germany and possibly in Scotland and the Faroe Islands. They migrate south to winter along the coasts of western Europe, Africa, southern Asia, Australasia and southern Pacific islands; as well as some wintering populations occurring along the Pacific coast of North America, from California south to Mexico or potentially even further south. Range: Breed in northeastern Alaska and most of Arctic Canada as far east as Baffin Island. They migrate south to winter in South Carolina south to the Gulf of Mexico, south central Chile and northern Argentina. 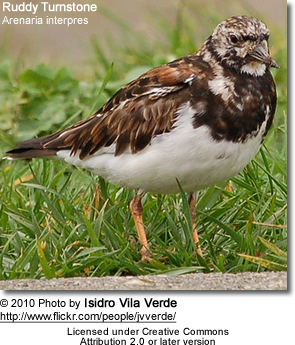 ID: Slightly smaller in size, with brighter reddish-brown upperparts and less black streaking on the crown. 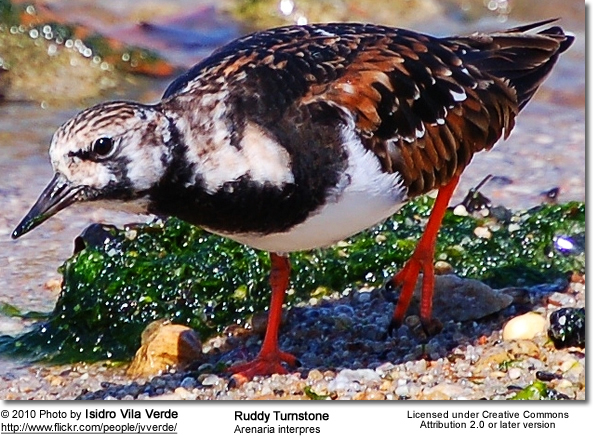 Ruddy Turnstones are stocky, medium-build waders that measure between 8.3 - 10.2 inches (21 - 26 cm) in length; including their short, bright orange/reddish legs that are about 1.4 inches or 3.5 cm long. Their wingspan is about 19.7 - 22.4 inches (50 - 57 cm). The slightly upturned, dark bill is about 0.79 - 0.98 inches (2 - 2.5 cm) long and wedge-shaped. They weigh between 3 - 6.7 oz (84 - 190 g), with an average weight of 4.1 oz (115 g). 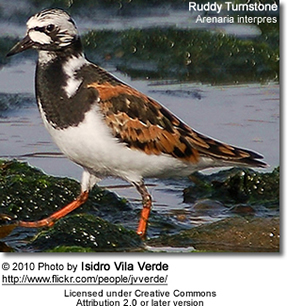 Their plumage is dominated by a harlequin-like pattern of black and white. There is a black patch on the chest and the abdomen is white. Non-breeding males and females look alike. Breeding females have more mottled and streaked crowns, browner necks and backs, and flecking on the chests. Juveniles resemble the non-breeding (basic-plumaged) adults, except for having a slightly more brownish plumage and a paler head. They have pale fringes to the back and wing feathers creating a scaly impression. 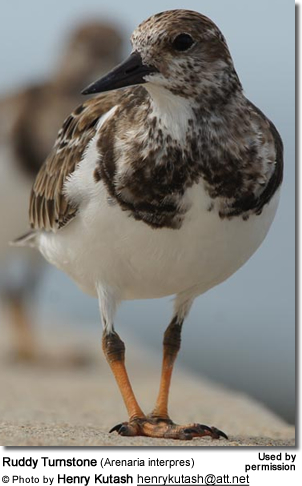 The related Black Turnstone of the Pacific coast of North America can most easily be differentiated by their black legs (orange in the Ruddy Turnstone). 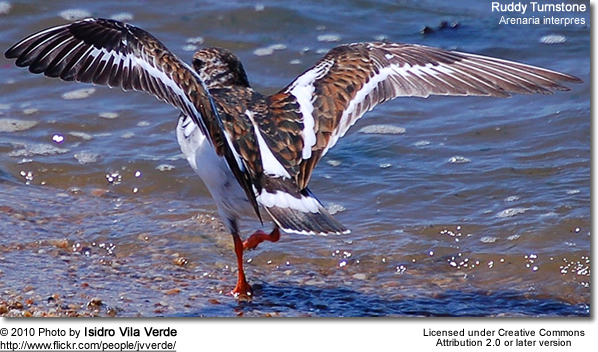 Black Turnstones also lack any red in the plumage, have dark chests and don't have the same intricate face pattern. Surfbirds have yellowish legs and a less patterned plumage. 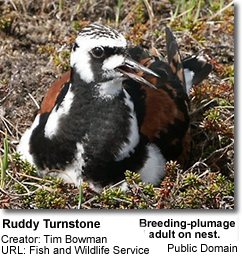 Ruddy Turnstones primarily feed on insects and their larvae (maggots) - such as midges and other flies, spiders and grasshoppers - especially during the breeding season. They also take spiders, crustaceans, small mollusks, worms, seeds, various plant matter (i.e., moss), and berries. On occasion, they will also eat small fish and birds’ eggs (terns), or scavenge on carrion and discarded human food. They mostly feed in flocks on the shore flipping over stones and other debris as they search for prey underneath. Large objects are sometimes pushed with the chest or several of them cooperate in moving them. Pairs form either before or after they reach their breeding grounds. They are monogamous, generally remaining together for one or several breeding seasons (particularly if nesting was successful). They breed on rocky arctic coasts and tundra. Most nesting occurs between May and August. As part of the courtship ritual, the males make makes nest-like scrapes in the ground within their territory - typically close to the final nesting site chosen by the females. The nest is a shallow scrape or a depression in the ground or vegetation, about 4.3 inches in diameter and ~ 1.2 inches (3 cm) deep. The nest is lined with grasses and other vegetation; and are generally placed in open areas on a slight ridge or hummock, close to bodies of water. A clutch can consist of 2 - 5 eggs, with the most common being 4. The glossy eggs are oval in shape and olive or brown in color, with dark brown spots and blotches. Each egg measures about 1.14 x 1.61 inches (29 x 41 mm) and weighs about 0.63 oz (17.9 g). The female will do most of the incubation, while the male guards the nest; however, he may assist with the brooding towards the end. The incubation period lasts about 22 - 24 days to hatching, and incubation starts with the first egg. The hatchlings are covered with down - buff-colored on the back with dark grey markings and white below. They are active and able to leave the nest and feed themselves in the first day. The females will start their migration south to their wintering territories when the young are about one or two weeks old leaving the males alone to take care of the young until they fledge at an age of 19 - 21 days. Their calls are described as sharp low rattling vocalizations; short, staccato tuk-a-tuk and long, rapid trills; and chattering alarm calls given mostly during the breeding season.